Give your controller the protection it deserves. 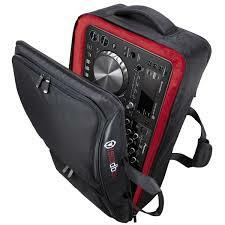 A DJ controller bag which is the perfect size to fit the XDJ-R1. The DJC-SC3 has protective cushions to prevent damages from vibrations and shocks. Transport your laptop safely to the booth, thanks to the laptop pocket inside the bag. Store your headphones, cables, tablet devices and more in the two pockets on the front of the bag. The bag can be carried in three different styles: as a handbag (vertically and horizontally), or as a backpack.